Before the Norman Conquest, in 1066, the manor of Olaveston, comprising some 180 acres, belonged to Ulfi the Saxon. By 1176 Adam de Morteyn is described as Lord of Wollaton and his family lived in a house probably on the site of the Old Rectory. They were responsible for part of the building of the existing church which was completed in the fourteenth century by the Willoughby’s who had acquired the Manor of Wollaton and adjoining parishes of Cossall and Trowell by purchase and by marriage after 1312. It was not until the 1460’s that the Willoughby’s moved to Wollaton, where they probably either rebuilt or expanded the Manor House. The Willoughby’s wealth derived from substantial coal mines in the parish as well as their extensive land holdings. Sir Henry Willoughby, who was buried in the church in 1528, died one of the richest men in England. His great grandson, Sir Francis Willoughby, set about building Wollaton Hall (1580-88) on the top of a nearby hill, surrounded by a park. The old Manor House was abandoned and by the mid 1600’s it had fallen into ruin. In 1711 Sir Francis’s great great grandson became Baron Middleton. He substantially altered the interior of the Hall but like most of his successors spent little time there. The fifth Baron built the new stable block and may have been responsible for almost completely rebuilding the village after 1750. In 1871 there were 658 people living in a total of 121 houses. In 1924 the village and estate were sold off. The Hall and the Park were bought by the City Council who proceeded to develop the eastern part of the Park with a new road, Middleton Boulevard, with housing on either side. The remainder of the Estate was also similarly developed and, in 1933, the whole of Wollaton Parish was absorbed within the boundary of the City of Nottingham. The Dovecote . Built around 1560 by Sir Francis Willoughby, it still has its original roof, with pantiles. Dovecotes were an important source of food in the winter and were kept by most important people. In the 1800’s it became a stable and subsequently fell into decay. It was rescued and restored, and re-opened, 25 years ago and now houses the Wollaton Historical and Conservation Society Dovecote Local History Museum which is open on the second and fourth Sundays of the month between May and September. Bramcote Lane . Formerly known as Noggy Lane which led to the old coalmines and brickyard. Today you can see the Russell School built in 1865 and beyond that the old school house for the head teacher. Beyond is The White House (1850’s) and a cottage originally part of the Nook Farm. Opposite is a former farm building (1870’s) now Bramcote Lodge on Smythson Drive (1980’s), named after the Architect of Wollaton Hall who is buried in the Church. The Square . In the centre is the Village Pump. Around The Square are two-storey 18th century cottages. Those on the South are larger. In 1955, and again in 1969, applications were made to demolish these cottages and replace them with modern shops. The local opposition led to their preservation and the founding of the Wollaton Village Preservation Society in 1972, now the Wollaton Historical and Conservation Society. In 1863, 59 people lived around The Square so these houses would have been very overcrowded! The rent was just over a shilling per week. All the tenants worked for the Estate, either on the land, at the Hall, or in the colliery. The Middletons were benevolent landlords, paying good wages, providing their tenants with gardens so that they could grow potatoes, and also supplying them with free coal at Christmas. Wollaton Road . Before entering Rectory Avenue (formerly Pig Lane), look at the house opposite, the Old Post Office. Originally three cottages, it was the Post Office in 1914. Looking down Wollaton Road, on the left is the Wright Institute (1900) named after the Middleton’s Estate Manager in the 1880’s. He was involved in every aspect of village life, particularly cricket. Beyond the Cricket Ground was the Village Pound where stray animals were kept. Opposite is Old Dairy Cottage, one of a number of old cottages which still survive, the others being hidden behind the new houses on Trowell Road. Before 1925 there was no Russell Drive (named after Rev. Russell); this was just countryside! Rectory Avenue . On the left are 3 cottages though the first seems to have been added later and the door to the second cottage is now a window. These are three storied, though the distance between the second and third floor is very limited. The lane leads down to what was called Pig Yard, on the corner is the Old Piggery. Opposite is another old cottage and, to the right, the old stables of the Rectory, now a house. The Admiral Rodney . Ahead is the old Barn. Referred to as an “old banqueting hall” it became the village school in 1841, having 80 pupils aged 3 to 11 years. After the new school was built it became the Village Institute for the working men and later a lending library. The pub was named after the Admiral, related to the Middleton’s by marriage, who had beaten the French in a great naval battle in the West Indies in 1784. 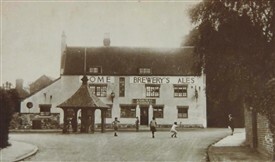 It was one of two pubs in the village, the other, the King’s Head on Trowel Road, was demolished in the 1920’s. Driveway to the Old Rectory . This may lead to the site of the original Manor House. The present building, obscured by trees, dates from the 1800’s and replaces an earlier rectory which was burnt down. In the 1850’s the Rector was Charles Willoughby, who lived here with his eleven children and five staff. He was the brother of Lord Middleton and when he retired he was succeeded by Rev. Charles Russell, the brother in law of the next Baron! Row of Three Cottages . Just beyond the entrance is a fine row of three cottages with attic windows on the third floor. In the 1800’s the first house was the village shop, though there was only room for three people at any one time! The far cottage was the police station. The constable being mainly concerned in apprehending poachers and no doubt giving naughty children a clip over the ear! Opposite is a stone cottage. This is the oldest house in the village, dating back to the 1400’s. It may have been a Chantry or the residence of the priest, or the original school referred to in 1472. In the 1850’s it was the Post Office. Net door is Ivy Cottage with pointed gothic windows. To the right is Wollaton House, occupied in the 1850’s by Mr Lyon and his family. He had been in the Royal Navy with Lord Middleton. The road to the Park used to be known as Church Hill, with the kennels off to the right on what is now Hurst Crescent. St. Leonard’s Church . Named, it is believed, as a result of the death of one of the Morteyn family on St Leonard’s Day in 1284. Before 1880 it probably had just one aisle. There are memorials to Sir Richard Willoughby (1491), Sir Henry and his four wives and the more sober memorials to the Middletons and the fine monument to Robert Smythson “architector”, the first person to be known as such. The South Aisle was added after 1886 when some of the memorials were relocated. In the Baptistry is an electronic image of the Antiphonal, the original of which is now housed at the University of Nottingham. This illustrated prayer book was given to St Leonard’s in 1460. Somehow it survived the Reformation and ended up in the library of the Hall, from whence it was returned to the church in 1925. This page was added by Angela Gilbert on 20/02/2013. i am an ex resident of Wollaton (1953-59) and reading the tour script brought back many memories. I attended Russell School and the Sunday School at St Leonard’s Church. I was one of the first pupils to attend Fernwood School, when it was built, and later Bilborough Grammar School. Is the scout hut still there by the cricket field? We lived in Arleston Drive - where does that name come from? My brothers and I enjoyed our time in “Woolly” and we’re sorry to leave.